I was fairly surprised with Honeydew Products Ultra Moisturizing Hot Cream, so I rated it 2.5/5 stars. I never know how these “hot creams” are going to end up. I’ve had some pretty crazy experiences with them (burning, painful rashes, intense adverse reactions, etc.) but it’s all part of process! I do it for you girlies (so you don’t have to) and for cellulite scorching science! Thankfully, I didn’t have any weird reactions to this hot cream. I’m actually pretty happy with the results! My skin was crazy soft and super hydrated. I guess it does have “ultra moisturizing” in the product name, but you can never be too sure until you try it. Sometimes these “hot creams” (and some cellulite products in general) actually have the opposite effect and dry out my skin. Not good! Especially because it makes my cellulite look and feel WORSE. But this Honeydew Hot Cream was very moisturizing and longer term ended up toning and firming up my problem areas a bit. It even helps soothe some minor aches and muscle soreness, so that’s a plus. It’s super cheap and they even have a money back guarantee, so you’re pretty safe either way. BUT it has some major drawbacks to it. It comes in a jar (which I think is uber unsanitary) and application is sort of a hot mess. The gel-like cream is wet and cold and unfortunately that feeling lasts forever. The product starts to “tingle” and that sensation lasts for about 2 hours. It’s pretty excessive and annoying after the first bit. I walked around with goose bumps and quite literally freezing my booty off after each application. The smell is also pretty god-awful. It has an INTENSE menthol smell that just overpowers everything. BUT taking everything into account, I still give it 2.5/5 stars because it definitely does what it’s intended to do. Honeydew Products Ultra Moisturizing Hot Cream is a cold, gooey, orange colored gel. It definitely wiggles around if the shake the jar a little. It has a jelly-like consistency to it. The “hot creams” always have an interesting application process. I never really know what to expect. With this one, it says to apply cream to the affected areas twice daily. It also says for best results to use after showering or on warm wet skin. You basically dip your fingers into the open jar, which is gross to me and unsanitary, and start applying to problem areas. The gel goes on pretty easily, it’s just cold. Once you’re all lubed up, you rub it in until it’s absorbed. The tingling sensation starts in after about 10 minutes. Luckily, this one was “tingling” and not BURNING. I’ve had horrible reactions to these hot creams so I’m always slightly concerned when lathering on new ones. The sensation feels good for about 10 minutes and then I’m over it. It just lasts WAY too long. But maybe that’s just me. And be sure to wash your hands after using! It takes about 10 minutes for the actual product to dry. That’s because the tingling sensation lasts for a ridiculous 1 to 2+ hours and the tingling sensation makes you so cold. I was walking around my house (it’s currently summer time and 110+ degrees in Arizona) and I had goose bumps and was freezing. Obviously I have air conditioning blasting but STILL. I didn’t like feeling ridiculously cold for so long. My goodness, this product is STRONG. In the jar, it has a VERY potent menthol smell to it. If you sniff it longer than a few seconds, it can give you a headache. It reminds me of Vicks Vapor Rub or a menthol stick that’s meant to clear your sinuses. Ugh, after you apply this cream, the menthol, peppermint smell lingers with you for hours afterwards. It’s super overpowering and I’m NOT a fan of this smell. Yuck. I feel like everyone around you can smell it and I was self conscious at times. The short term results are pretty awesome. After just the first use, my skin felt crazy soft. Cellulite products are hit and miss when it comes to moisturizing and hydrating. I was surprised how well this one works in that department. My skin definitely feels softer. It’s also considered a muscle relaxing cream. I do think it helps soothe some of my aches and pains, especially my sore muscles after working out. The long term results are better than I anticipated. After using it for a while, I noticed that my skin feels a little bit tighter. My problem areas (mostly my booty and back of my legs) look more smoothed out. I feel like it does help with the appearance of my cellulite somewhat! 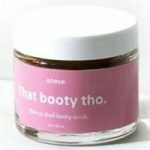 Obviously no cellulite product is going to banish cellulite altogether (or at least not yet). But if you’re realistic with your expectations and consistent with the process, it can definitely help! There’s quite a bit going on in Honeydew Products Ultra Moisturizing Hot Cream. They use a number of ingredients that are believed to be very beneficial! Ginger Lily is thought to stimulate circulation and help reduce the rippling effect of cellulite. Aloe and Meadowfoam Seed Oil are believed to decrease inflammation and increase hydration to help soften and smooth your skin. This cream includes citrus fruit tangerine and grapefruit, which are suggested to brighten skin while promoting elasticity and collagen production. Calendula flower extract is utilized to help tighten skin and smooth fine lines and wrinkles. Honeydew Products includes Menthol and White Camphor to create the heated muscle relaxing effect. Menthol may also help increase blood circulation and tighten the skin. There’s also a great deal of fruit and plant extracts and essential oils that provide skin-nourishing antioxidants and vitamins such as Vitamin E, A, and D.
A 4 oz jar is $14.95 on their website. But the link sends you directly to their Amazon page and for whatever reason it’s only $12.95 right now, so you may be able to get a little cheaper right now! I bought it for $14.95 and that’s what it’s usually listed at so at that price it ends up being $3.73 per ounce. That’s super cheap and affordable for a cellulite product! Honeydew offers a 100% money back guarantee on all of their products available on HoneydewProducts.com. It doesn’t look like there’s a time requirement (30, 60, 90 days, etc.). They say on their website that if you buy a product for your own use and are, for any reason at all, not happy with the results — they will either replace it with a more suitable product, or give you a full refund. So that sounds simple enough! You can call their Customer Service department at (844) 754-6639 from 9AM to 4PM EST Sun-Thurs or email them through their contact us page. To buy Honeydew Products Ultra Moisturizing Hot Cream, click here.